A bird inspired lunch today for T, last night as we made our loo roll bird feeders, we talked about what birds like to eat, how we can help them and we can grow food for them to eat. I explained how, when the sunflowers we've grown have flowered they will provide food for the birds. I decided that I would like to incorporate birds into todays lunch. I always ask T what he'd like and today he asked for sausage rolls which I served with cucumber and carrot sticks with dip and a cupcake case of currants and sunflower seeds. When I gave T his meal, straight away he asked what the sunflower seeds were, I told him that they were the same as some of the seeds we gave the birds last night and he said 'from our flowers in the garden?' he may not understand everything that we discuss but he is starting to remember our conversations and link back to them from time-to-time. I love that we can link our projects and activities. T got stuck right into his sunflower seeds, the fact that he was eating 'bird food' didn't bother him at all! This post is linked to Fun food Friday at Eats Amazing. Such a fun lunch - I love how you've used the bird theme based on your conversations and the 'bird food' too - will have to try presenting seeds like that and see if I can get my little one to try them again too! 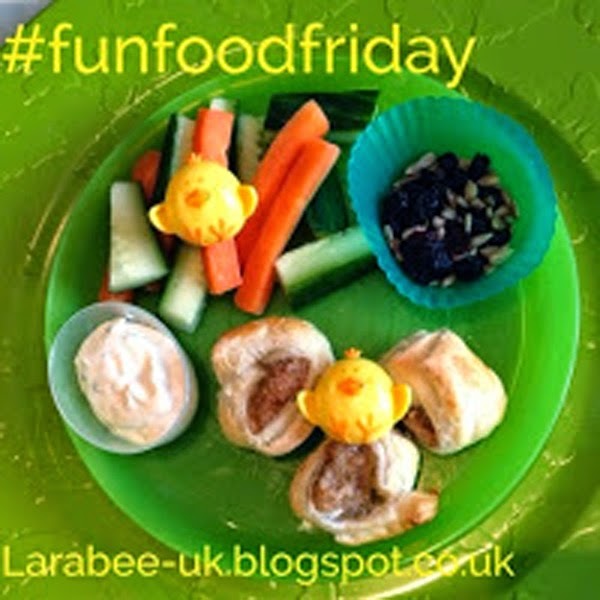 Thank you for linking up at Fun Food Friday!